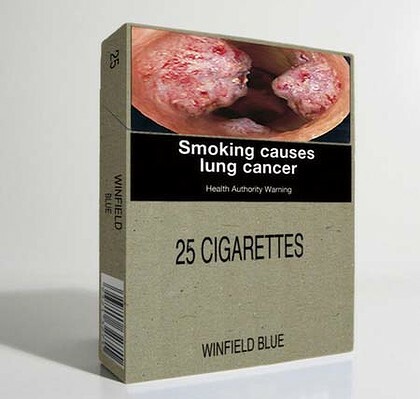 An example of what the new plain cigarette packets will look like. So, the move to cigarette plain packaging will do nothing to reduce the rate of smoking, but it will be a pain in the proverbial for shopkeepers. I’m told this at least once an hour on talk radio, so it must be true. But things aren’t always what they appear to be. I know this as a reformed tobacco executive. I was employed by Rothmans of Pall Mall from 1994 to 1998 in Queensland, NSW and Victoria in charge of about $250 million in annual supermarket sales. Working for big tobacco is a double-edged sword. Sure, it’s a legal product, and you could get hit by a bus tomorrow (although I’d take my chances with the bus versus smoking). Over time, I started to feel the imaginary horns attached to my head, especially when asked by my child’s teacher what I did for a living. But other than that, we ruled the world. In those days, cigarettes made up six of the top 10 supermarket products. Not exactly part of the fresh food mantra, but it wasn’t hard to get an audience with the bigwigs at short notice. The guys flogging baked beans and shoe polish had to stand in line. Our products were money in the bank. The industry was cashed-up and was not afraid to spend it. The laws were slightly more relaxed, and often tobacco retailers had to do no more than sign a lease. The three tobacco companies would fight tooth and nail to do the shop-fit free, and in some cases pay the rent in exchange for the rights to a window display. The rule of market share dictated that ”if it can’t be seen, it can’t be sold”. We employed all kinds of surveys measuring our visibility in stores, and lived and died by the results. For marketing, the brand was everything. People don’t just smoke a brand, they are the brand. What’s inside the cigarette doesn’t really matter, but what the smoker thinks about themselves (true or not) is absolute. If you’re a bus driver, but aspire to being an internationalist with a passport to smoking pleasure, you’ll buy accordingly. And it’s not just the brand, but the appearance of the pack . . . how it feels, the fonts used: everything was analysed and tested to the extreme. When NSW tightened the noose on in-store advertising, cigarette package images were replaced with tantalising shots of sunflowers and Uluru. The theory was that people would associate these images with the colour of the brand they smoked. Publicly, the big round of packet health warnings in the ’90s was treated as a speed bump. Like a duck on a lake, beneath the surface things weren’t so calm. One of our bosses referred to the move as an ”absolute disaster” and our focus moved to producing retail stands and lighting that deflected from the top of the packet. Removing cigarettes from visibility in stores has introduced an impediment to the process, but the allure of the brand still remains – even with an ugly health warning. Olive-green packets will not be cool; there will be no differentiation between one brand and the next. Even the mythology, for those of us who remember the Hoges and Stuart Wagstaff TV ads, will disappear. The tobacco companies invest a lot in research, particularly in statistics. Every move in price and circumstance is modelled to the N-th degree. As the it-won’t-affect-us-honestly-it-won’t ads increase, you can bet they reflect the anxiety of the industry. My opinion as a former insider? The proposed plain packaging changes will hit sales hard. Craig Seitam is a marketing consultant. Poll: Should the government push through with legislation for plain packaging on cigarette packs?